The Bullfrog is our newest Spinning Wheel model, and hit the market in August 2018. It folds up in seconds for easy carrying and includes three 16 oz bobbins. The carrying handle makes it easy to bring with you to fairs and festivals. The heel pad folds up for a small footprint when not in use. The Bullfrog is available in our most popular large flyer size (16 oz) which is also compatible with our 8 oz bobbins (sold separately). 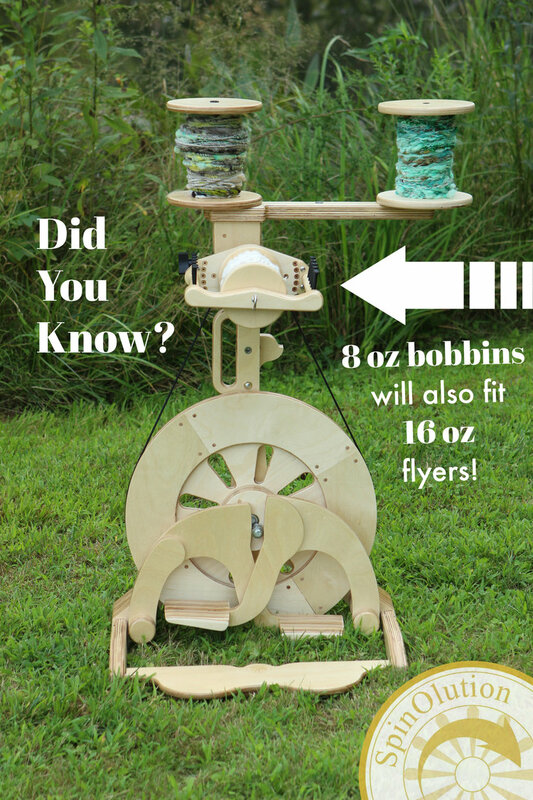 Spin up your singles on 8 oz bobbins and ply onto a 16 oz bobbin with room to spare. This 8 oz / 16 oz compatibility runs true on all of our wheel models.